The tour starts and ends in Denpasar, Bali Indonesia. 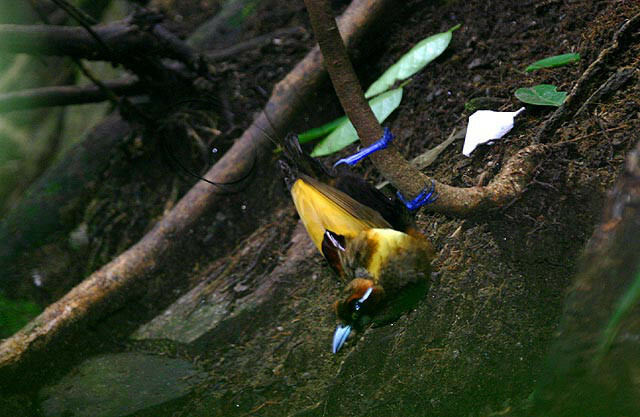 Get some of the most amazing Birds of Paradise in only 14 days. In Arfak mountains we can see Superb BOP, Western Parotia, Arfak Astrapia and hopefully Long-tailed Paradigalla. In Waigeo we can see Wilson’s and Red BOP. There are no hotels where the birds are. We stay in local houses where the accommodation is simple and rooms have to be shared. Toilets and washing facilities will be very basic, but available in every village we stay. Bring your own sleeping mattress and mosquito net. The trekking will be from moderate in Waigeo to tough in Arfak mountains. As we travel off the beaten track, it will be far to doctors and hospitals. Please be prepared with your prescribed medicines from your local doctor. Be sure to take the inoculations that your doctor prescribes. Malaria vaccine is mandatory as Papua is infested with klorokin resistant malaria. Malarone or Lariam are the drugs of choice for this area of the world. Day1 We will meet you at the airport in Denpasar, Bali. We’ll have time for briefing, dinner and getting to know each other. We fly from Denpasar to Manokwari at 20.00. There’s an overlay in Makassar, South Sulawesi in the middle of the night and we arrive early in the morning of day 2. Day 2 MANOKWARI: We’ll go to the local market and get supplies for our time in the Arfak Mountains. Mehd will also report to the local police as we’re obliged to do. After that we’ll start our journey up hill to Mokwam and Zeth Wonggor. The road to Mokwam is very steep and we will stop for resting and birding on the way. 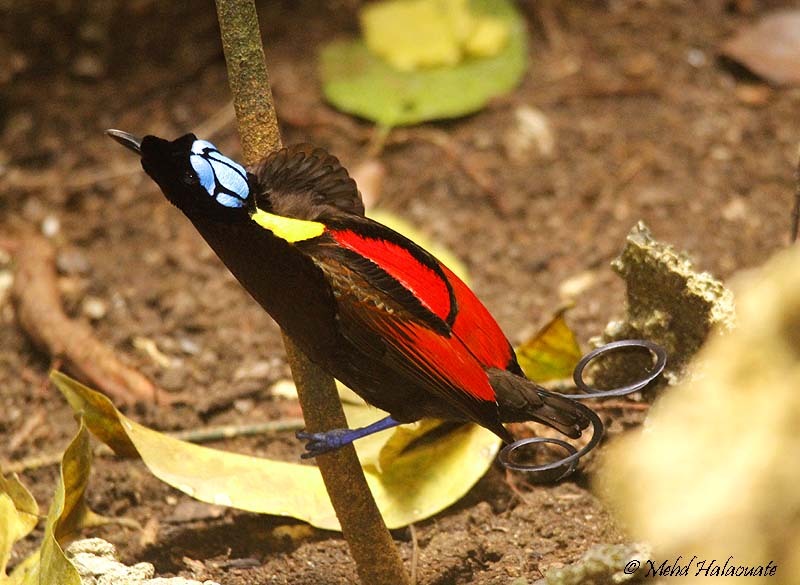 Day 2-6 ARFAK: We stay with Zeth in his guest house and probably one night in the jungle, one in the Garden house for Western Parotia and Vogelkop Bowerbird and on night in the Japanese camp for Arfak Astrapia and Black Sicklebill among other gems. Zeth has built hides for watching Magnificent Bird Of Paradise, Vogelkop Bowerbird and Western Parotia. We also hope to see Long-tailed Paradigalla, Mountain Peltops, Black-breasted Boatbill among others. Arfak mountains can be cold at night, so you’d need to pack some long sleeved shirts and even a hat an sleeping bags for the garden house and Japanese camp. Day 6 We get back from Mokwam to Manokwari in the afternoon an spend the afternoon relaxing by the sea and stay the night in a hotel. It will be nice to have hot shower again. Day 7 We take the 50-minute morning flight from Manokwari to Sorong. We check in to the hotel and go out for birding in the afternoon outside Sorong. Here we hope to see Black Lories which are endemic to the area. Day 8 WAIGEO: Early morning birding outside Sorong. We leave Sorong in the afternoon to go to Waigeo by speed boat. Day 8-13 WAIGEO We will stay in a local village and bird for Red and Wilson’s BOPs. Apart from these gems there will be parrots flying over our heads all day long! The villagers will cater for us and get us coconuts straight from the palm trees and grill fresh fish for us. Don’t forget to bring swimming and snorkeling gear. Raja Ampat (where Waigeo is one of the four islands) is one of the best snorkeling and diving waters in the world. The beaches are beautiful and we’ll have birds flying across the sky just outside our huts. Day 13 SORONG We return to Sorong from Waigeo by speedboat in the afternoon and spend the night in hotel. We will have time to get to the local market shopping for presents to bring back home. Day 14 We fly back to Bali with an overlay in Makassar again. We’ll opt for the afternoon flight which leaves at 14.00 and land in Bali at 20.00 in the evening. There will be time for dinner together in Makassar and you can have a massage for you sore muscles if you want to. Mehd will accompany you to Bali. We’ll say our goodbyes at the airport in Bali. An English-speaking guide at all times. All domestic flights, including tax and transfers. All accommodation and all meals and water/soft drinks. Air fare from your country to Bali, Indonesia. Visa to Indonesia. Please contact your local Indonesian Embassy for further details. Tipping guides and the local families we stay with.